How much consideration do you put into choosing which affiliates links you use? For most of my podcasts, affiliate links are easy—Amazon.com for everything because they sell everything at usually great prices. and anything else that helps podcasting. The decision for a link is hard when affiliate programs vary in payouts and certain companies will happily reshare my content if I use their affiliates exclusively. But when a single product is the same price on several sites, it's even harder to decide which affiliate to use. I appreciate the affiliate relationship I have with B&H, but I know it's often more convenient and cheaper for my audience to purchase from Amazon.com. A quick poll on Twitter, Facebook, and Google+ revealed overwhelming preference for Amazon.com, even when other retailers had the same price. The reasons usually focused on the following. I even prefer Amazon.com for most purchases because they usually have the best price, we have a warehouse nearby, and I regularly earn free giftcards from Swagbucks. Am I violating any rule by using an affiliate link to a retailer I may not prefer? Then looking on the profit side, I usually make more money through my Amazon affiliates than I do with other affiliate links. Almost every month, I sell enough items through my combined Amazon tracking IDs that I earn a 6.5% commission (I'm always so close to 7%!). Each additional item sold through Amazon increases the possibility that I could earn a higher percentage rate. Amazon offers handy widgets and plenty of linking options, including simply adding “tag=danieljlewis-20” to any URL to turn it into an affiliate link. Then there's B&H. They have a great website, accurate search, great customer service, and handy link creation. While they offer a variety of widget formats, making widgets are a pain. My earning potential with B&H is a little lower. But they've reminded me that if I exclusively use B&H affiliate links in my product reviews, they would share my reviews with their social-media followers. And the better I perform, the more likely I can borrow some demo units for more reviews. For most podcasting equipment I talk about on The Audacity to Podcast, I end up including affiliate links to both Amazon.com and B&H. This makes my linking process twice as long. So what's the ethical thing to do? I believe that is to continue offering Amazon.com affiliate links first unless a better price or better product is available elsewhere. Sure, this won't make me popular with companies like B&H, but I believe this will give my followers the right options for them to make their own choices. After all, they're smart people. How do you handle affiliate links for the same product from competing retailers? I'd love to hear your opinions and experience in the comments below. Launching my own personal blog wasn't enough. Now I'm starting a new project for May, I will post a daily photo related to podcasting for my how-to podcast about podcasting and using Audacity. These posts will contain tips, tricks, tools, and thoughts about the art, technique, and technology of podcasting. If podcasting interests you, or you want a creative look at the guts of a podcasting studio, follow The Audacity to Podcast's blog, or subscribe to the mailing list from the website. This is also an opportunity for you! I anticipate these posts may get popular. Would you like to sponsor a day? Email Daniel@DJosephDesign.com if you'd like to sponsor a day for only $50. 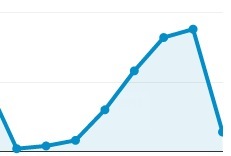 This image represents my daily visitors since launching and publicizing my new personal blog. As you can see, my daily blogging with interesting information and compelling titles has caused a significant boost in my daily traffic. Now look at the left end of the chart. That drop was yesterday, when I forgot to blog anything. Oops. Did I just let it slip that I'm trying to blog every day? If you didn't already get that impression, get it now, and maybe it'll help hold me accountable. I'm very much a communicator, as you know from my podcast network. But until I had launched danieljlewis.com, I felt like I had so many things to say, but not the right place to say them. Now I have me—I mean danieljlewis.com—which can be anything I want it to be. No, this doesn't mean I'll blog pointless nonsense. (That's what Twitter and Facebook are for, right?) I want danieljlewis.com to be content worth reading and resharing. Stuff that will help you or someone you know. 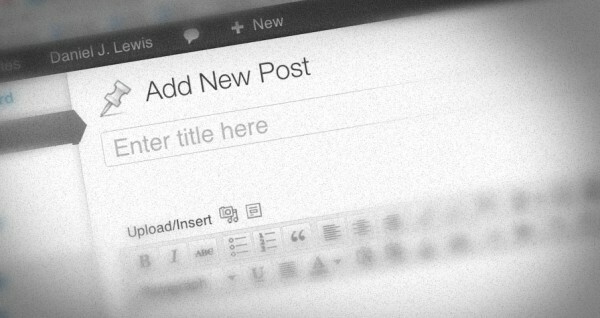 I'll generally blog on freelancing, social media, technology, and web design. Let's see if that makes the blue line happy again.